Together with two other international companies, Kuiper Compagnons has won a competition for the best design for the extension of a town and the development of a recreational area in a part of Shanghai, known as the Pudong area. The Dutch company ended in a draw with a Chinese and an Australian company, after having been selected amongst other international urban planning companies who were invited to participate by the municipal administration of Gaoqiao. During visits to the Netherlands, the Chinese were so impressed by the current urban planning developments in the former harbour areas of Rotterdam and Amsterdam, that the competition was given a motto called 'Gaoqiao Town, a modern town with a Dutch character'. 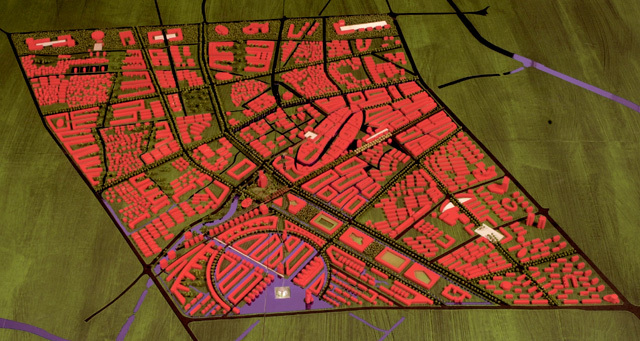 The present urban district of 5,6 km2 will be restructured and extended, because of the expectation that by 2005 the present number of 600.000 inhabitants will grow to 1.200.000 inhabitants. Other than the urban district, a new recreational area of 3,6 km2 at the head of the peninsula at the mouth of the Yangtze river must also be designed. Gaoqiao Town presently lies enclosed between container harbours and warehousing areas in the north-east, a business zone with offices and warehousing in the North and oil refineries and chemical industry in the West. There are flats, farm-houses and shacks all mixed together. Lengthwise across the peninsula there is a large highway which will lead to the other side of the Yangtze via a tunnel within the next few years, and which is part of the outermost ring road, the economic artery. A regional road runs passed Gaoqiao and the business zone. Between the two roads, the designers have drawn a large wedge-shaped ecological zone across the peninsula. This encompasses the preservation of the open landscape with its reservoirs, dykes, pastures, creeks and accretion polders. 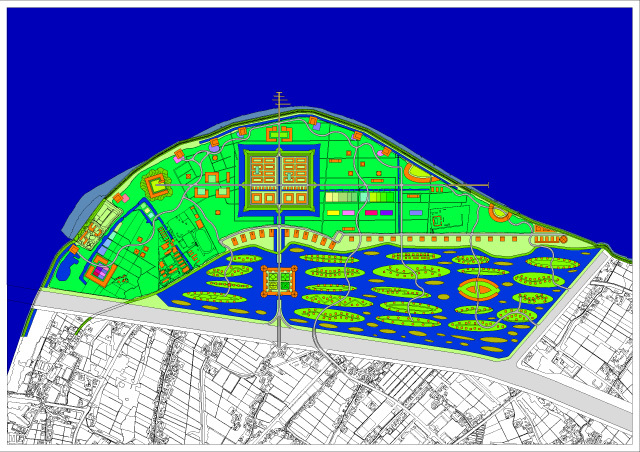 The water system with all its existing elements of the landscape is the base of the green wedge. Business activities can only be placed near to the town, sunken into the landscape. At the Northern end of the peninsula there will be a recreational area and spread-out houses. One section will be flooded; islands with single homes will stick out like dwelling mounds above the water level. A traffic axis will join up a new 'fortified town' and 'estates'. 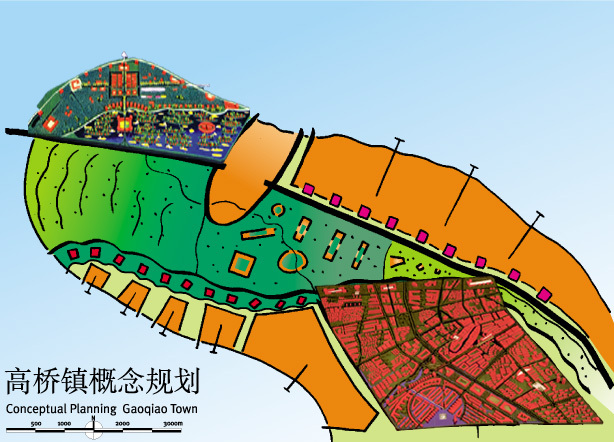 The urban planning design for the town of Gaoqiao has a cross-shaped structure. This encompasses the preservation of the town centre, existing valuable buildings and water courses. 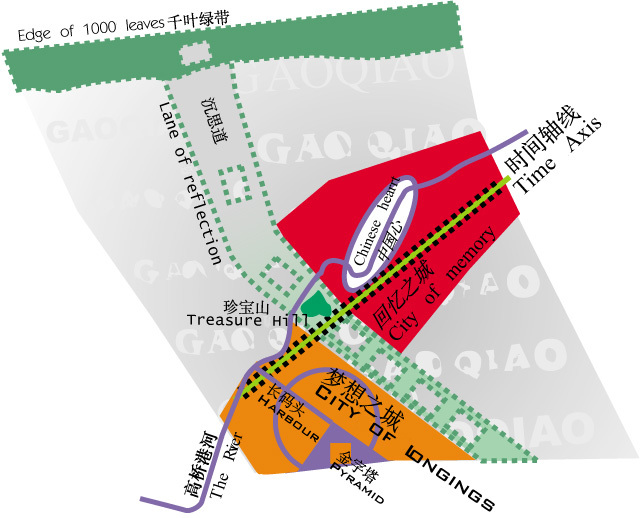 A symbolic time-axis, parallel to the Gaoqiaogang river through the town, connects the areas: the City of Remembrances, the City of Longing and, at right angles thereto, the Avenue of Contemplations with its broad, green strip that stretches for many kilometres. For the architecture a specific choice was made for a mix of Chinese and Dutch typologies with many forms of expression which depicts the meeting up of the various cultures and shows that each house has its own signature. Areas with enclosed blocks of buildings, terraced houses and single homes lend their specific character to parts of the town. This is reiterated by new water systems with canals and crescents. Greenery and water serve to provide and maintain light, air and space in Gaoqiao. It must be avoided that the town becomes clogged up by the expected expansion. The human scale of the various parts of the town can be stressed through urban planning structure and by architecture.